Welcome to Foot & Ankle Specialists of Connecticut, P.C. 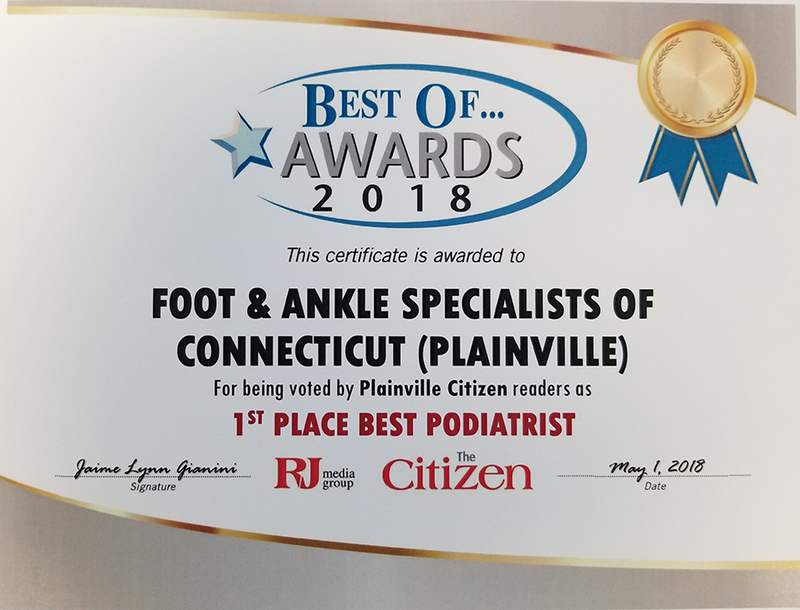 Foot & Ankle Specialists of Connecticut, P.C. has been providing effective foot and ankle care for more than 30 years. We take pride in the level of service that you can receive from us. Visit us at any of our three conveniently located Connecticut locations. When you have problems with your feet or ankles, you need to turn to a podiatrist or foot doctor who listens and responds ... an experienced doctor who knows the field and can effectively diagnose and treat your needs ... a friendly doctor who counsels you on the best ways to maintain and improve your health. Our foot doctors and staff meet all these criteria. Plus, you benefit from a dedicated team of trained professionals who give you the individualized attention you deserve. Foot & Ankle Specialists of Connecticut, P.C. believes that informed patients are better prepared to make decisions regarding their health and well being. That is why we've included an extensive section on this web site covering the full array of topics associated with podiatry and foot and ankle diagnoses and treatments such as plantar fasciitis/heel spur syndrome treatment. We encourage you to look through these pages whenever you have an interest or concern about your feet especially in regards to heel pain and bunions. The best care in the world doesn't mean anything if you can't access it. At Foot & Ankle Specialists of Connecticut, P.C.,we strive to make our offices as efficient and convenient as possible. Included in these web pages is information about Foot & Ankle Specialists of Connecticut, P.C. 's office, including our locations, maps, directions, hours, insurance policies and appointment scheduling. You can even email a request for an appointment right here! "The entire experience was great. The office was easy to find, had free parking and they were very prompt. I took my 90 year old FIL for a foreign object (piece of thin wire) in his foot. Another doctor said it couldn’t be removed as it was too far into the foot. Dr. Treadwell was fantastic. He had a great bedside manner and was patient and kind to my FIL. He was able to remove the wire in a matter of minutes. I highly recommend him!"